SO WHAT’S WITH THIS COLD WEATHER? People are asking me, what’s with this prolonged winter weather and cold? One thing not talked about recently is the solar cycle. We are about to enter a solar minimum. The solar cycle is a regular, periodic change in sunspot number and the mimimum correlates with reduced total solar irradiance. The solar cycle repeats ever 10-11 years. 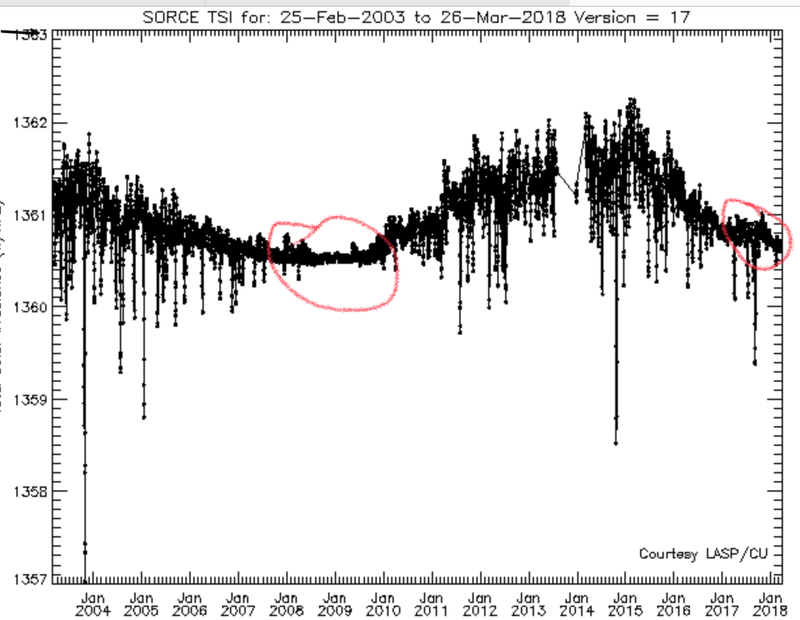 The SORCE PROJECT has been measuring the total solar irradiance since 2003. 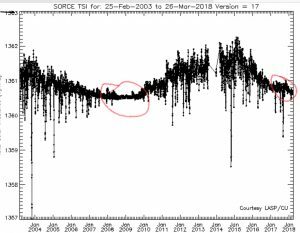 The previous solar minimum was in 2009. The minimum has been shown to have a total solar irradiance that is reduced by about 0.5 -1 watt/m2. Over the surface of the entire earth, that reduction adds up. So if it’s a cool summer, remember, it may be the sunspot cycle. BTW, Here’s a link from my old blog in 2009 talking about the solar cycle. Clarification 4-14-18: When I say cooler weather, it doesn’t mean we won’t have heat waves. 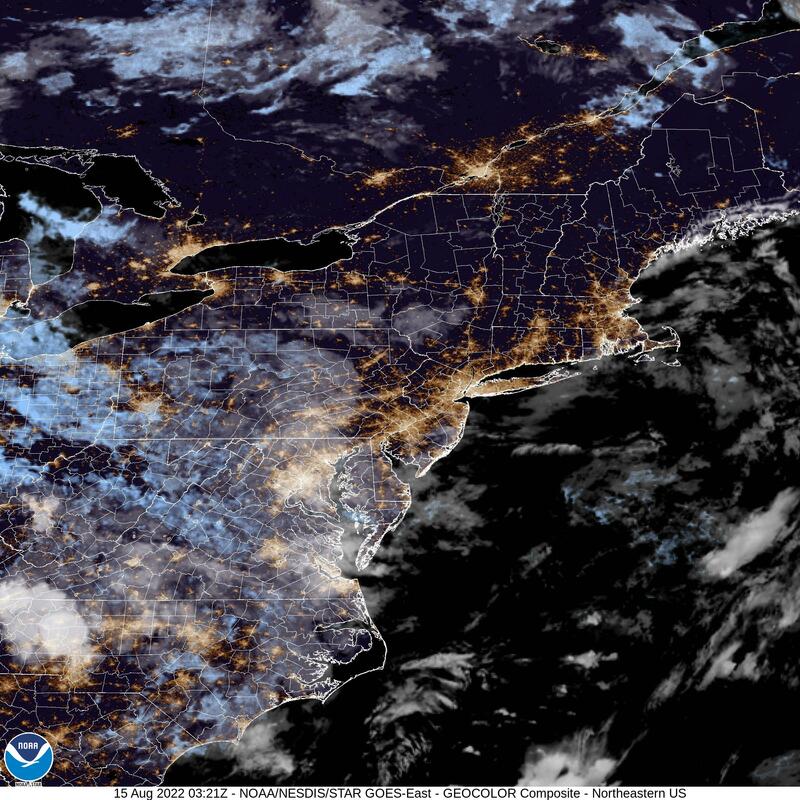 But it means that there will be fewer days in the 90s and average temperatures for the months of June July and August may be just below average. Previous PostPHILLY MONDAY SNOW FORECAST- SUNDAY NIGHT EDITIONNext PostSNOW FOR SATURDAY? Speaking of the cold weather, I saw surprised to see on the weather channel app the prediction for 3-5 inches (Downingtown) for Saturday. The NWS forecast discussion mentions the potential for some snow in the area but nothing more specific. Could it be that winter isn’t over yet? Too early to predict accumulation but the potential is there for some snow.